Gout is the disorder in which monosodium urate crystals are deposited in the joints of the body resulting in painful, red and swollen joints. The symptoms typically include pain, swelling and redness at the joints where the urates are deposited. The first symptoms often occur in the toes, at the joints found between the toes and the feet. Painful nodules known as tophi can eventually develop in patients who have gout; these can result in deformities of the joints and even osteoarthritis. Complications of gout include problems such as kidney stones and kidney infections. The condition can be diagnosed when uric acid crystals are noticed in the fluid taken from the joints. This is the synovial fluid which can be examined under a microscope. Blood tests can also be done to measure how much uric acid and creatinine is present. Ultrasound can be done of the joints and can show urate crystals present. X-rays may be used to eliminate other causes of joint pain and inflammation. The condition occurs when the amount of urate in the blood plasma is more than 6.8 mg/dL. It is more common in men than women and tends to be caused by both genetic as well as environmental factors. 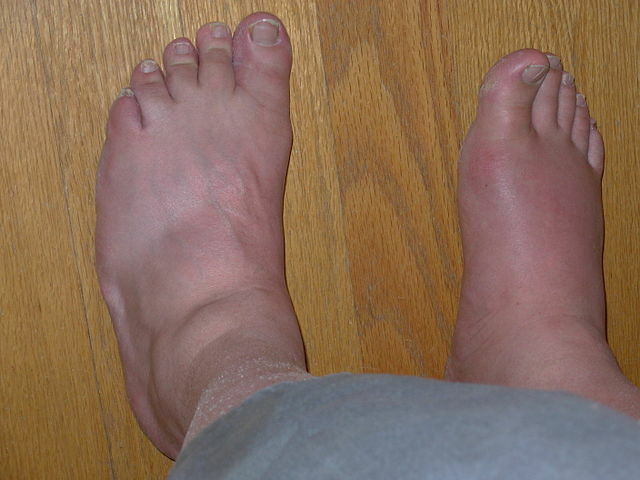 Individuals who have metabolic syndrome are also at increased risk of developing gout. The disorder is more common in men and in those individuals who drink alcohol because this reduces the kidneys’ ability to rid the body of uric acid. The condition can cause a type of chronic or severe arthritis as a result of these crystals of uric acid. You can help to prevent gout by avoiding or reducing the amount of food you eat that contains lots of purines, since it is the breakdown of these that produces uric acid. Foods such as sardines, some meats, and dried beans tend to have lots of purines. The condition can be treated using colchicine and nonsteroidal anti-inflammatory drugs. Medicine can also be used to lower the concentration of uric acid in the blood plasma; for instance, febuxostat and allopurinol can be used to accomplish this and help prevent or reduce the deposition of urates in the joints. Bursitis is the condition in which the fluid-filled sac at a joint becomes inflamed causing pain and discomfort in the joint during movement. It can be a chronic or an acute problem. Symptoms include stiffness, tenderness, and pain with movement or if you apply pressure, as well as swollen joints where the bursae are affected. The joints most often affected are those where there is a lot of movement, for instance, the elbows and knees, but toes can be affected as well. Septic bursitis is a complication that can occur in which the bursa becomes infected. This is more common in people such as carpenters and plumbers due to their occupation. The condition can be diagnosed by looking at bursal fluid extracted from the joints. The use of X-rays and MRI can help to eliminate other possible causes of pain in the joints. The cause of bursitis is often repeated use of a joint, so if you are throwing a ball often or kneeling on the floor a lot. This means that people who play sport or have certain occupations in which joints are repeatedly in motion are most at risk of developing this condition. If you have diabetes, arthritis or gout you will also be at increased risk of getting bursitis. The disorder can be treated using anti-inflammatory medications and also corticosteroid injections and splints. You can help prevent the condition of bursitis by warming up properly before playing sport, by using pads to kneel on and lifting objects with care. Keeping a healthy weight will also be advisable and can help prevent illnesses like diabetes type 2 which can lead to an increased risk of bursitis. Gout is the condition in which monosodium urate crystals are deposited in the joints causing pain, swelling and redness. Bursitis is the condition in which the fluid-filled sac, known as the bursa, surrounding a joint, becomes inflamed. Gout can be diagnosed by examining the synovial fluid for the presence of the urate crystals. X-ray can help eliminate other causes of gout. Bursitis can be diagnosed by looking at bursal fluid and also by eliminating other causes by using MRI or X-ray. The condition of gout can be caused by genetic factors as well as environmental factors such as having metabolic syndrome and eating food that is high in purines. 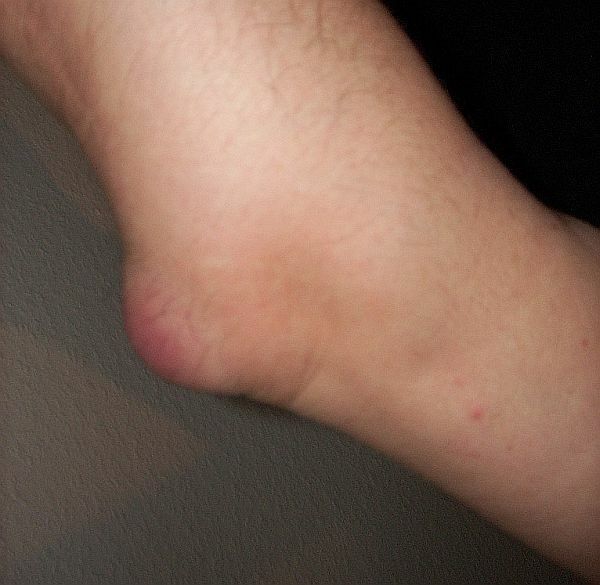 The condition of bursitis is caused by repetitive motion of joints, and is thus common in people who play a lot of sport and in certain occupations. Gout is partly caused by genetics, so having a family history puts you at increased risk. Also having metabolic syndrome, drinking alcohol, being male, and eating many foods high in purines increase the risk of developing gout. Bursitis is more likely in people who play a sport in which there is repetitive motion of a joint, as well as people who have certain occupations. Arthritis, diabetes, and gout are also risk factors for bursitis. The treatment for gout includes using anti-inflammatory medicines and colchicine, and medicine such as febuxostat and allopurinol to reduce the amount of uric acid in the blood. The treatment for bursitis involves using anti-inflammatory medicines and corticosteroid injections, and splints to immobilize a joint. The problem with gout is that it can lead to the development of tophi, kidney stones and kidney infections. The problem with bursitis is that sepsis can develop which can be very dangerous. Gout is the condition in which urate crystals are deposited in joints. Bursitis is the condition in which bursae, sacs found at the joints, become inflamed. Both conditions cause painful, red and swollen joints. Both gout and bursitis can cause complications which can further jeopardize your health. Dr. Rae Osborn holds Honours Bachelor of Science degrees in Zoology and Entomology, and Masters of Science in Entomology from the University of Natal in South Africa. She has received a PhD in Quantitative Biology from the University of Texas at Arlington. She was a tenured Associate Professor of Biology at Northwestern State University in Louisiana for 10 years. She also completed an AAS Degree in Information Network Specialist and an AAS in Computer Information Systems, at Bossier Parish Community College in Louisiana. Dr. Rae Osborn. "Difference Between Gout and Bursitis." DifferenceBetween.net. 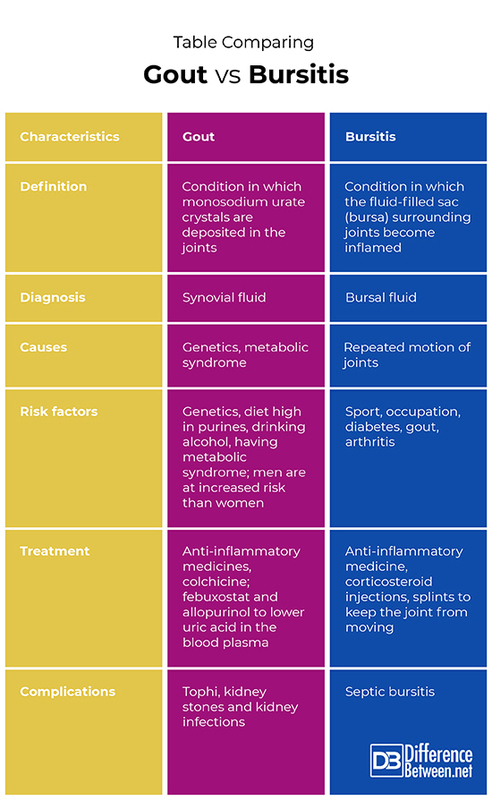 November 5, 2018 < http://www.differencebetween.net/science/health/difference-between-gout-and-bursitis/ >. Ho, George, Alan D. Tice, and Stephen R. Kaplan. "Septic bursitis in the prepatellar and olecranon bursae: an analysis of 25 cases." Annals of internal medicine 89.1 (1978): 21-27.